Rocket fired from Gaza explodes in an open area of the Shaar HaNegev Regional Council. No physical injuries or damages. 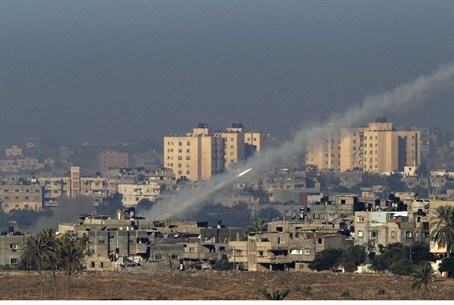 Gaza-based terrorists fired a rocket at southern Israel on Monday evening. Shortly after 11:00 p.m., the “Color Red” siren was heard in the Shaar HaNegev and Sdot Negev Regional Councils. The rocket exploded in an open area of Shaar HaNegev, causing no physical injuries or damages. The attack was the second rocket attack on southern Israel within a few hours. On Monday afternoon, terrorists from Gaza fired a rocket which exploded in an open field near the Ashkelon coast. No physical injuries or damages were reported. The IAF responded Sunday by wounding a senior Gaza terrorist, 29 year-old Abdulla Harti, who had been directly involved in rocket attacks on Israel. Gaza's steady upswing in rocket attacks came after Hamas gave terrorists the "green light" to open fire last Sunday, by withdrawing its forces that were deployed to prevent such rocket fire. On Tuesday that force was redeployed, but this has had little effect.